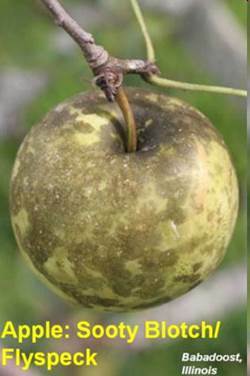 Sooty blotch and flyspeck are diseases of apples which result from fungi colonizing the fruit surface without penetrating below the peel. These fungal colonies simply grow on the surface of the apple. However, consumers don’t want to purchase apples with any blemishes. As a result, numerous fungicide sprays are used to prevent the fungal colonies and meet consumer demands. Authors: Diaz Arias, M.M., et al. Title: Diversity and Biogeography of Sooty Blotch and Flyspeck Fungi on Apple in the Eastern and Midwestern United States.